For the first 6 years of my life I never tasted north Indian food! My mom although is a wonderful cook, her knowledge was limited to south Indian cuisine at that time. One reason could be that we lived in a small town and grew up in a close knit community. Till I turned 6 years old, we lived in a joint family and the simplest food to cook was a south Indian food which she grew up eating and cooking for 30+ members of the family with steady flow of guests every single day. 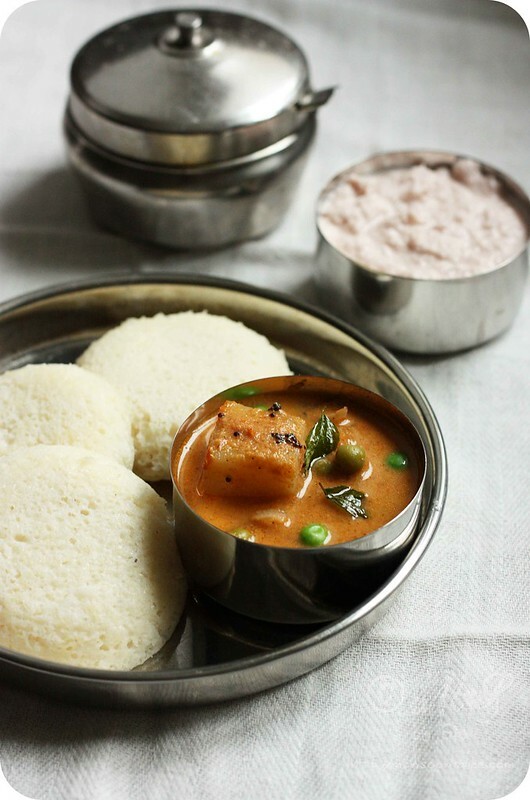 Our regional food of Udupi-Mangalore is something that everyone enjoyed in our family. The daily meal consisted of Palya (a quick stir fry of vegetables or greens topped with freshly grated coconut), Saaru (a lentil based tomato soup), and either Kodhel/Huli (a traditional coconut or lentil based vegetable curry) or Majjige Huli (mild coconut based vegetable curry). Our meals always ended with a bowl of homemade curds/yogurt or chilled buttermilk mixed with steaming hot bowl of Rosematta (unpolished red rice) rice and oil-free mango pickle. During summer the buttermilk based curries like Tambli and Majjige Huli were on the menu along with Sasve of made using fruits, raw vegetables or greens which had the cooling effect to beat the heat. Homemade Happala/Papads and Sandige in different shape, flavours and colours always accompanied the meal with finger licking wide variety of pickles that were made through our the year with seasonal fruits or vegetables, especially during hot summer months of mangoes! With fresh fruits or tall glass of sweet Lassi served as a dessert, we enjoyed a wholesome, nutritional and healthy food that not only nourished our body but touched our souls with its simplicity and freshness using the freshest produce grown in our backyard or farm without a drop of pesticide. 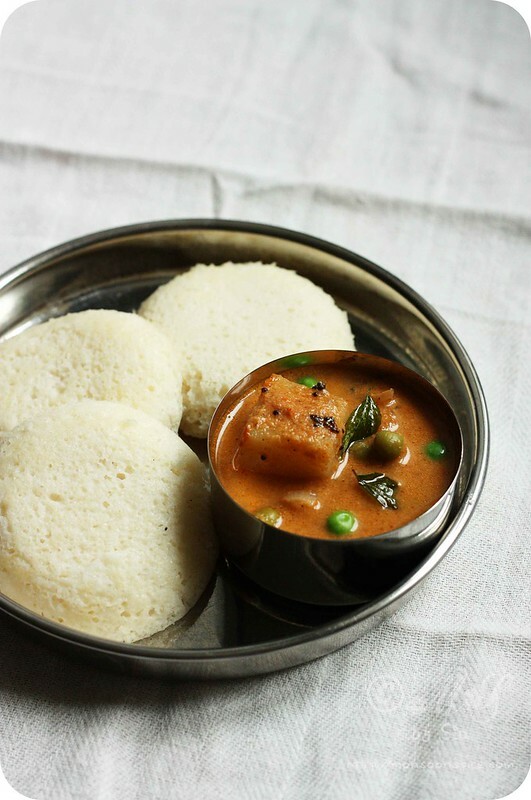 It was only after we moved out from our ancestral mansion in our native village and settled in a nearest town for our education, Amma slowly began experimenting with other regional cuisines of India. It was not easy for her to learn as there were no dedicated cookery shows or that many cookbooks explaining recipes from other parts of the country. Whatever she learnt were from her interaction with our neighbours and my aunts who lived in northern parts of India. With basic understanding of ingredients used and cooking techniques, my mother went on to improve her cooking skills, techniques and knowledge and thus learnt to cook some of the best north Indian foods. One day she surprised us with her Potato and Peas Kurma, which had ingredients used in both north Indian style of cooking as well as our own regional Udupi-Mangalorean cuisine. The warmth of whole spices, sweetness from coconut, hint of sourness from tamarind and spice kick from red chillies infused into crumbly potatoes and sweet green peas made this Potato and Peas Kurma an instant hit with everyone in our family. She served this delicious Kurma with freshly cooked chapatti smeared with pure Desi ghee and her love. It was one of the best meals and its taste lingers in my mind even after decades. Since then my Amma has mastered many recipes both from other parts of India and world, but for me this simple and creamy Potato and Peas Kurma still stands out as one of her most delicious food I have ever tasted in my life. 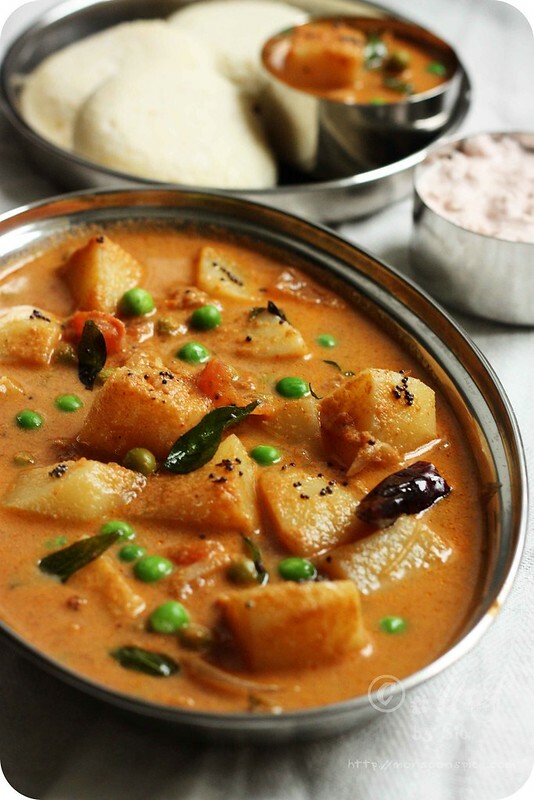 Today I am sharing my Amma’s signature recipe of Potato and Peas Kurma which is very close to my heart! For a very long time I kept this treasured family recipe locked in my heart and at last have decided to share it with you all! 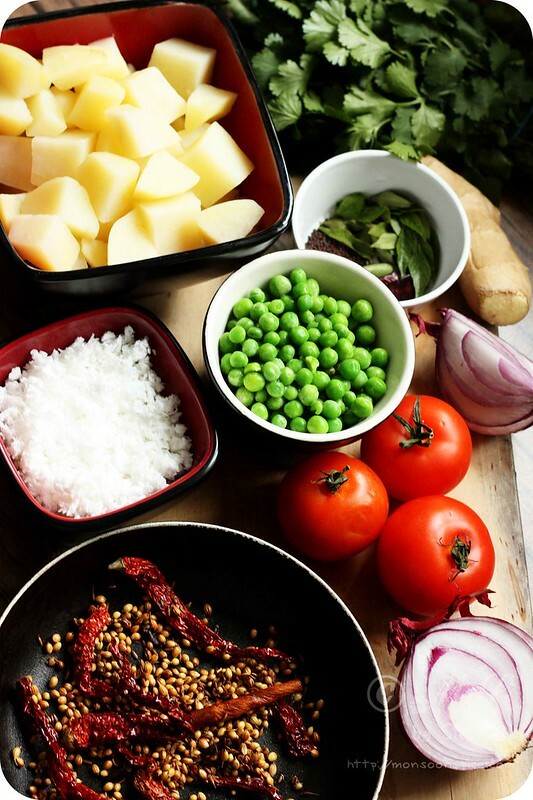 There are many variations of this Potato and Peas Curry as every region and every home has their own signature recipes made using different ingredients, spice combinations and cooking techniques. 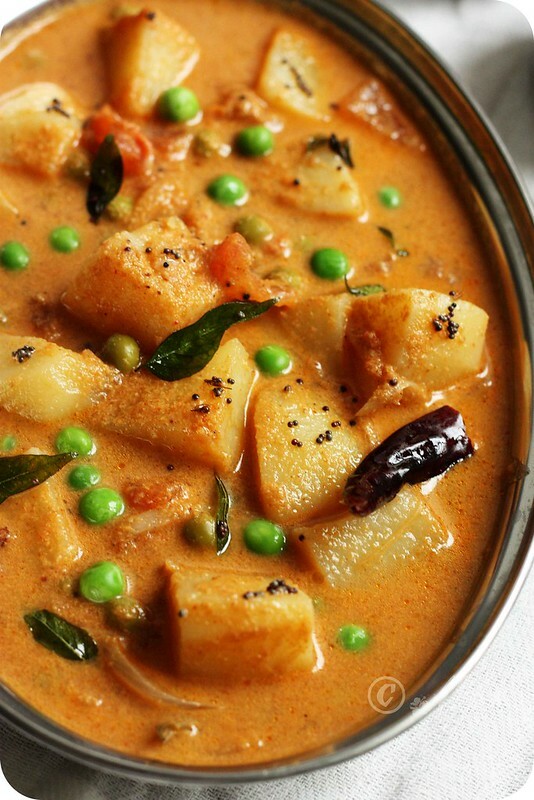 But for me my Amma’s Potato and Peas Kurma will remain the very best Kurma dish. 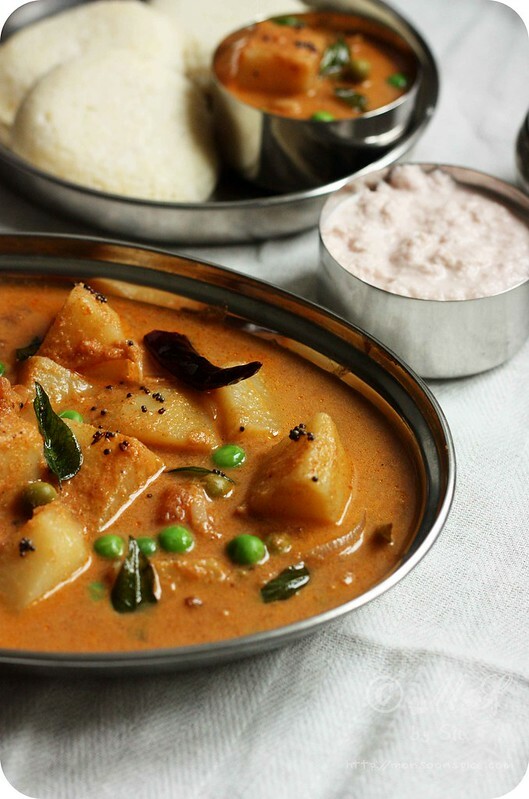 From the use of selected aromatic spices to the unique cooking technique, this Potato and Peas Kurma has won many hearts over the years by everyone who had a chance to taste. 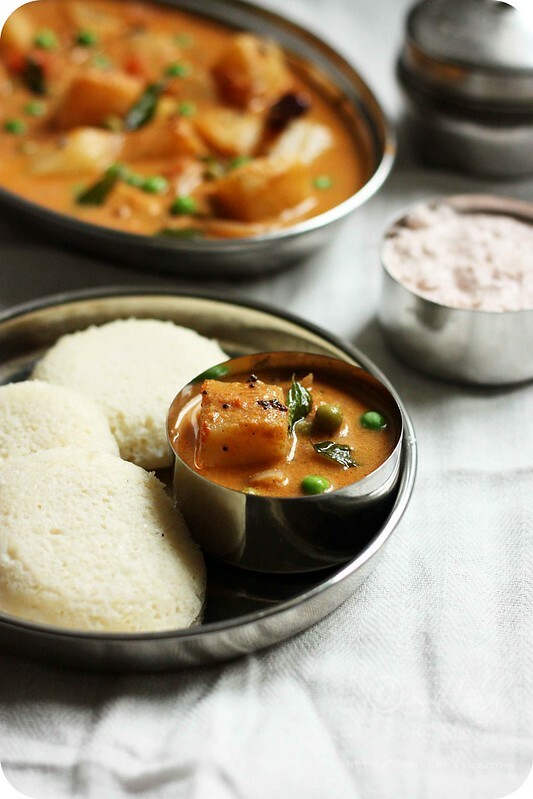 Creamy Potato and Peas Kurma with steaming hot Idli ~ Marriage made in heaven! Potato and Peas Kurma usually made its appearance on last Sunday of the month as it was one of those great delights of life that needed to be relished without rushing. To make this Potato and Peas Kurma, my Amma’s the prep work began a night before just before she retired to bed. The dried green peas were washed several times before soaking them in enough water overnight to rehydrate them. Next morning she would cook the whole potatoes in their skins and green peas in her trusted decade old pressure cooker in two containers. We woke up to the noise of hissing pressure cooker and the rhythmic sound coconut being grated in a traditional coconut grater. Soon the aroma of roasted spices would tease our nose along with freshly brewed filter coffee competing for its share of attention and admiration. By the time we washed our face and brushed our teeth, the heady aroma of spicy coconut paste getting cooked added little more life to our feet. While the Potato and Peas Kurma bubbled away, the ladleful of Dosa batter was poured on a hot cast iron tawa or griddle to make perfectly crisp Dosas and the hot steaming pillow-y soft Idlies were removed from the mould and placed in a large hot box. 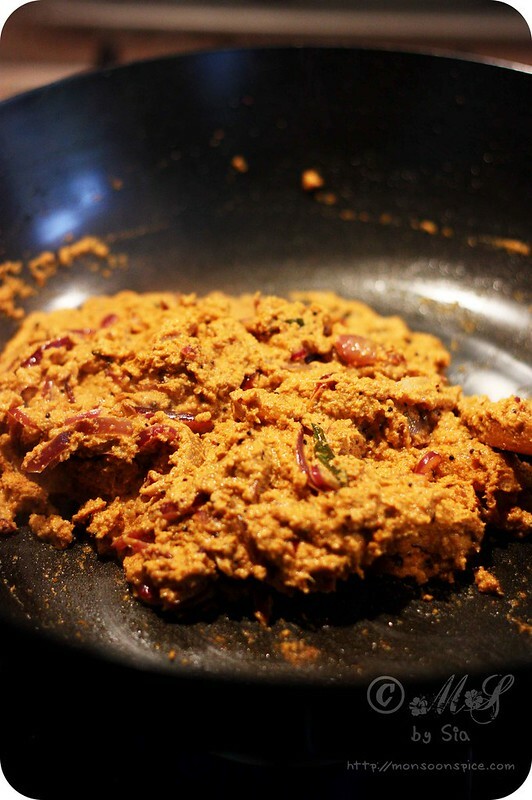 Quickly the coconut chutney was ground and jaggery was melted to make thin syrup to be enjoyed with a big dollop of freshly churned butter or ghee. For the next half an hour or so the only noise heard were appropriate appreciating noise from closed mouth full of delicious food and the sight of the food on table disappearing at lightening speed and amused but satisfied smile on Amma’s face! 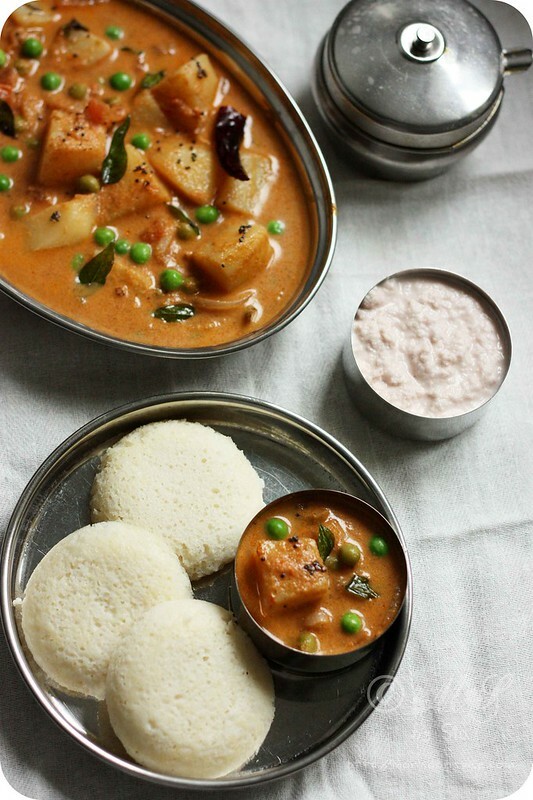 Potato and Peas Kurma with Idli ~ Perfect breakfast or lunch or dinner! Peel the potatoes and cut them into large 1½ inch cubes. Pressure cook the potatoes with enough water (about 3 cups) and 1 tsp of salt for 2-3 whistles or for 13-15 minutes on medium flame. Let it rest for few minutes before releasing the pressure by lifting the weight with a help of tongs. Alternatively you can cook the potatoes in microwave or on stove top in a heavy bottomed pan with lid with enough water and salt. While the potatoes are cooking, prepare the coconut paste. 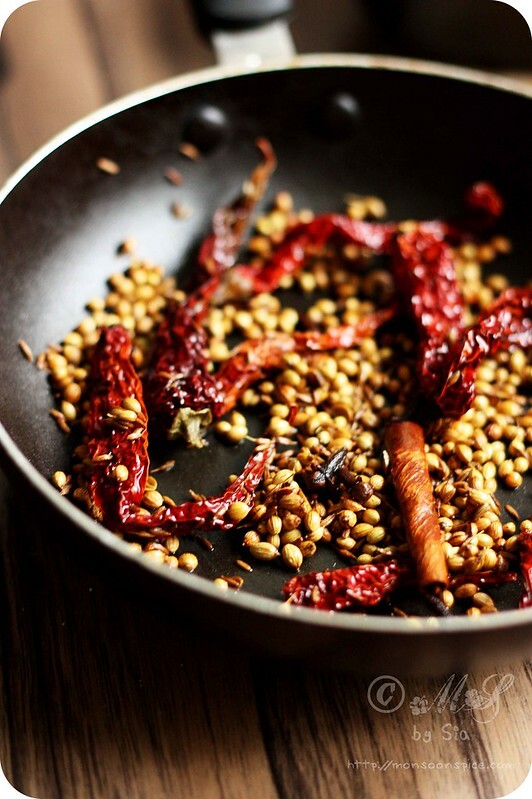 Heat about 1 tbsp of oil in a pan and add coriander seeds, cumin seeds, cinnamon, cloves, fennel seeds and dry red chillies. Roast the spices on low flame for about 2 minutes until the colour of the spices deepens and aroma of roasted spices wafts. Add these roasted spices to grated coconut, ginger and tamarind pulp and grind to smooth paste by adding little water at time. Remember not to add to much water as we want fairly thick coconut paste as shown above in the photograph. Keep it aside until needed. Heat oil in a pan and add mustard seeds. When mustard seeds start to pop and crackle, add dry red chilli, hing and curry leaves. Mix in sliced onions and sauté till the edges start to brown, about 2-3 mins, on medium flame. Next mix in ground coconut paste and cook it till the paste becomes little dry, about 3-4 minutes, on medium flame. 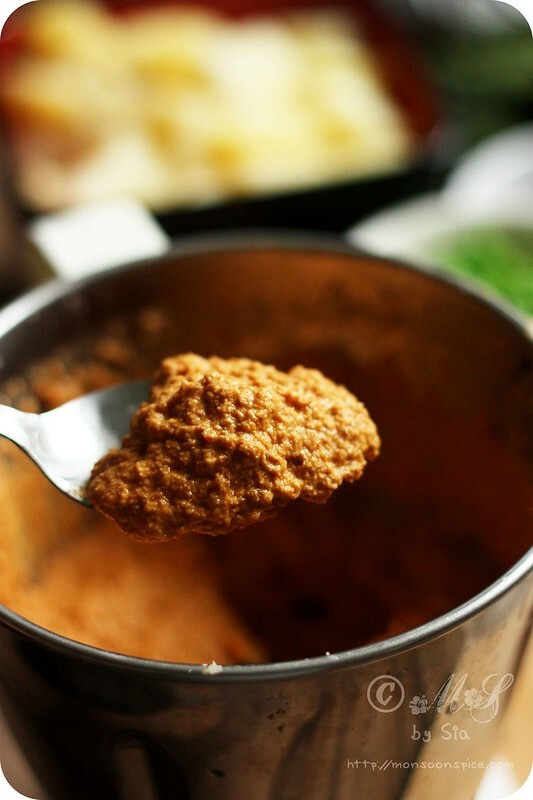 Add chopped tomatoes, jaggery and salt to taste and sauté till the tomatoes turn pulpy and releases its juice, about 2-3 minutes, on medium flame. 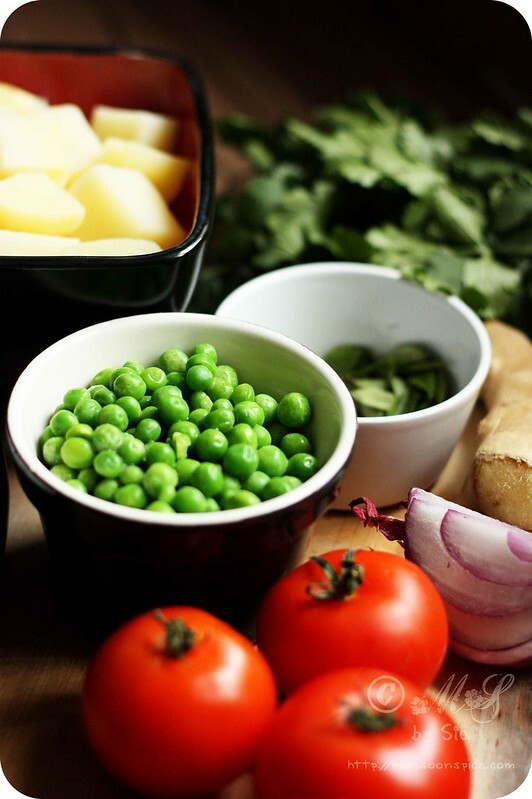 Mix in cooked potato along with the water in which they are cooked and also add the fresh/frozen peas. Add salt to taste and reduce the heat to low. Let it simmer uncovered for 5 minutes without disturbing. Add about a cup or two of water if you find the gravy too thick. Increase the heat to medium and let it cook for another 2-3 minutes or until small bubbles start to appear on surface of the Potato and Peas Kurma. Do not over cook or boil the Kurma for long time as the coconut in the gravy will start to release its oil and there will be difference in taste. Switch off the flame and cover and let it rest for atleast 15 minutes for all the flavours to blend well. Serve this delicious and creamy Potato and Peas Kurma with plain rice, ghee and papad or with any Dosa/Idli/any Indian flat bread. 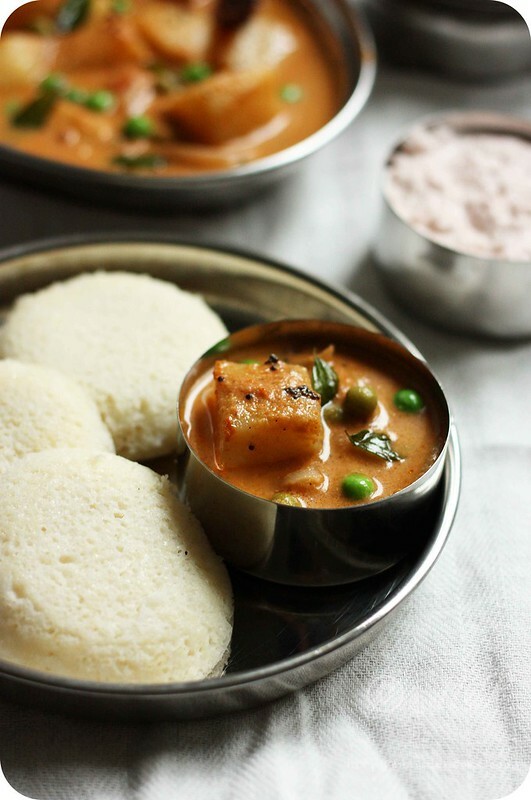 My Amma uses dried peas most of the time. About ¾ cup of dried peas is soaked overnight and it is pressure cooked on the next day. I use fresh or frozen peas as it speeds up the cooking process. My Amma also boils the whole potato before peeling and dicing them to bite sized pieces. The best way to cook the potatoes is in pressure cooker. To cook in a pressure cooker, place the scrubbed and washed potatoes in a container and place it in the pressure cooker with 1- 1½ inch high water in the pressure cooker. Do not add any water to the container with potatoes. Cover the cooker with lid and place the weight/whistle. Cook the potatoes on high flame for 6-7 minutes or 2 whistles. Lower the flame and let it simmer for another 7-8 minutes before turning off the gas. The large potatoes will take little longer to cook. Let the pressure release completely before opening the lid. Check if the potatoes are cooked through by inserting the sharp knife or fork. Once the potatoes are cool enough to handle, peel the skin and dice them in to 1½ inch cubes. Do not rinse the hot potatoes under running water or cold water as the potatoes will turn soggy. While preparing the coconut paste, remember not to add to much water as we want fairly thick coconut paste as shown above in the photograph. A beautiful kurma. Just looking at it makes me hungry! Looks so creamy and delicious. How I wish I can have that plate now! You know Sia you literally took me to your childhood.I could just imagine the breakfast scene.I too am from Udipi and know how the houses over there are.It was fun.Keep writing. just love your pics sia. this recipe is bookmarked and pinned. 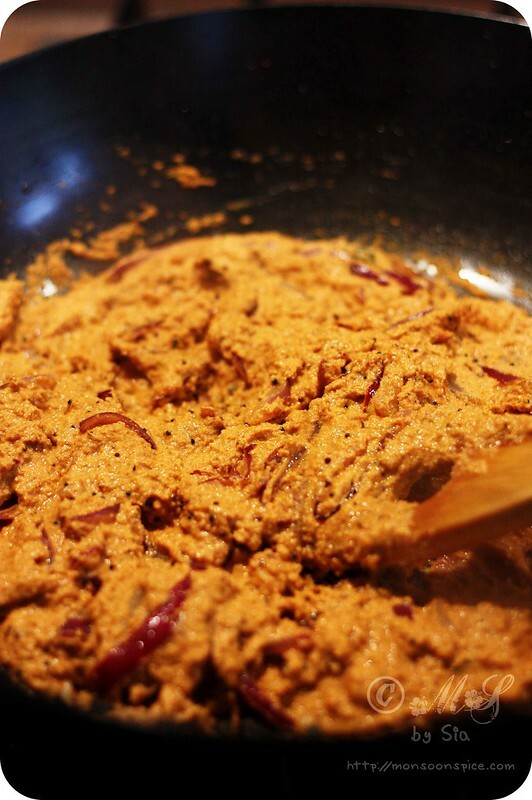 The word 'kurma' itself means that curd has to be added, but there is no curd in your dish. Isn't this more like spicy aloo peas curry? @Anita, Ah… I was hoping that someone will ask me this question :) so thank you! Kurma or Korma as it is popularly known can be made with yogurt, cream, nuts (almonds, cashews etc) or coconut based gravies. The Navartna Kurma which basically is a Mughali dish has fresh cream and cashew nut/almond based gravy. In Udupi-Mangalore region from where I come from, Kurma is usually prepared with fresh coconut milk or coconut paste and we don’t use any milk or milk produce in it. 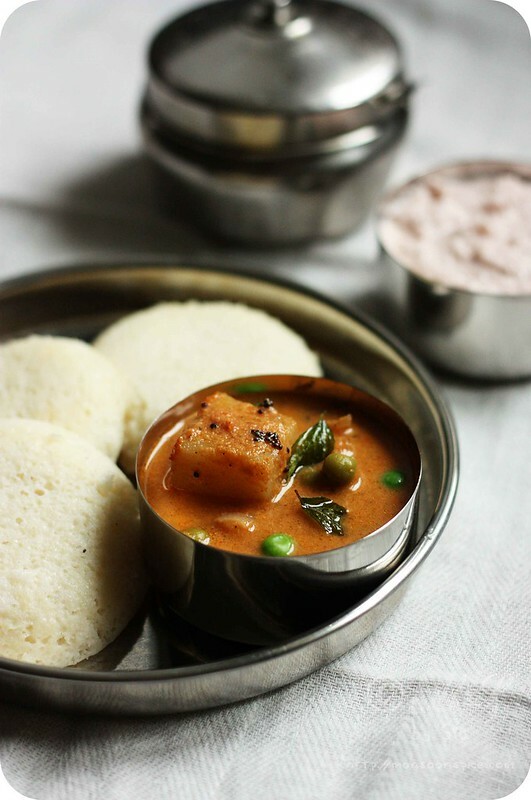 You will find similar vegan Kurma served in many Udupi restaurants as well as few south Indian small eateries where there is not even single drop of milk is added. ps: Loved reading about your childhood -- brought back so many wonderful personal memories! Gorgeous post! Love this kurma and we make a very similar version as well at home. I can almost smell it on my computer! And it smells goooooood! Hi Sia, I tried your potato peas kurma and it came out great! Thanks for sharing your recipe!! Just wanted to drop in a line to tell you I'd made this and thank you for sharing the recipe. I was looking around the web for a veg gravy option for a party we had with some friends last night. Found this recipe and made it with mixed veggies and served it with neer dosa and ghee rice. Turned out great and everyone enjoyed it. Earlier last night I tasted it as soon as I'd made it and thought it would have gone really really well with pooris. Have saved some of the kurma for pooris one of these days.